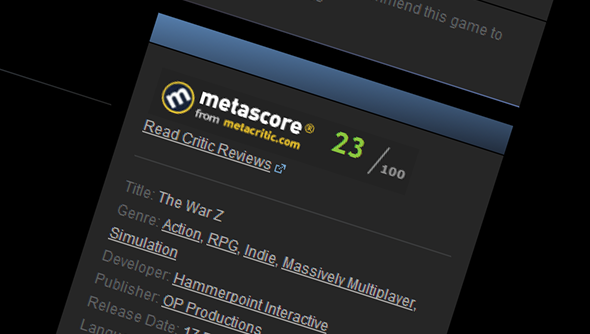 After being removed by Valve following many, many, many complaints, The War Z has returned to Steam to try its luck a second time. Looking through the game’s listed features we can see where the work has gone to avoid a repeat of the last fiasco. It seems to have been largely a cover-up job. The War Z originally drew criticism from its claims that it featured more than one map and that each of these maps was between100 and 400 square kilometres, Steve found these estimates were generous. Also suspect was the claim that the game supported 100 players per server when those who owned the game found it was capped at 50. Even before its release on Steam The War Z was receiving criticism, we found it to be a prettyatrociousgame when we got hands-on with a beta copy, and we also found that the Terms of Service had been copied from Riot’s League of Legends. As you can see, no mention of number of maps, their size, orplayer numbers. It could be that developerHammerpoint has done nothing to address these concerns, only removing them from the list to avoid claims offalse advertising, or they may have been fixed. I couldn’t see any of the issues being addressed in the patch notes compiled on The War Z’s forum.